The appearance, pipe marks and style of manufacture link the organ at Merton with Thomas Parker, who worked with Richard Bridge and had his own workshop in Grays Inn Lane ca1750-1770. Parker made the organ now at Great Packington in Warwickshire, and the organ at the Foundling Hospital in 1768-9. The Merton organ dates from around 1760. 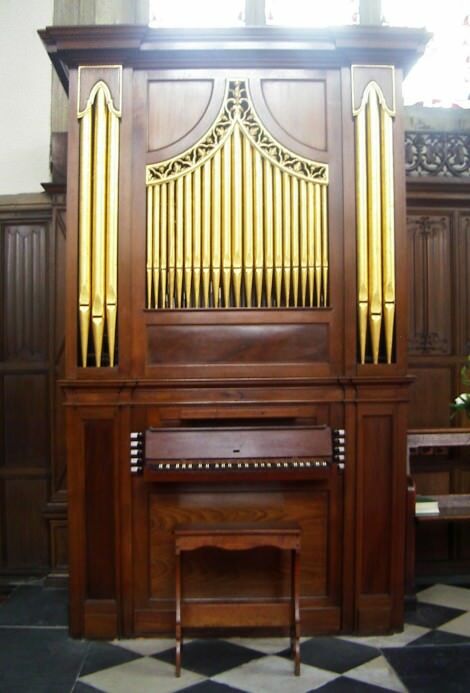 Before it went to Merton, the organ stood in Hawkstone Park, Shropshire, and perhaps originally in Hodnet Hall, Shropshire (home of the Heber-Percys). It does not seem to have been altered in any way until 1912, when it was repaired by Balsar Ludwig of Banbury, with minor alterations to the case, chest, the Cremona and mixture, and the pitch and tuning. Walkers repaired the organ, also with minor alterations (including electric blower), in 1965. The survival of the Cremona and the original bellows system make this organ particularly interesting. In 1999, Martin Goetze and Dominic Gwynn carried out cleaning and repairs. The restoration of the gilded front pipes and the pipe shades, was carried out by Chris Wells of Stannington near Sheffield, and of the finish of the organ by Charles Marsden of Tickhill near Doncaster. New stop jambs with paper labels were made to replace those provided in 1912. The front was made to be removable again, to facilitate tuning, and a new roof was provided. The mixture had been recast in 1912, and was restored to its original composition. The tuning slides were retained, left at modern pitch, but with an unequal tuning. The Cremona was repaired as found. The leather of the bellows was reinforced, a new trunk replacing the faulty kopex connection to the cut-off valve.